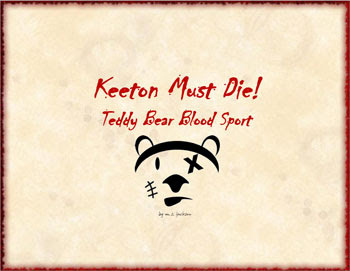 Keeton Must Die is a free RPG where you play the part of Teddy Bears with evil souls against Dr. Keeton, the Occult student who filled empty teddy bear skins with evil. A simple dice pool mechanic and some superb character descriptors give Keeton Must Die a neat and rounded system. 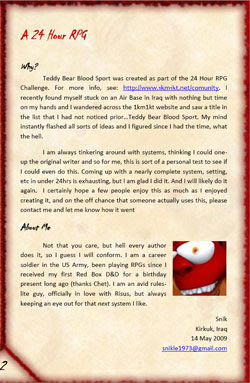 Keeton Must Die was winner of the 1KM1KT / Free RPG Blog 24 hour competition, let's find out why. The thin setting is modern day fantasy, where an evil Dr. Keeton uses occult practises to force evil spirits into the husks of unsold teddy bears to fight on TV. Fight to the death. For advertising revenue. Some bears were better than others and those that kept surviving became superstars. It's no wonder that these superstars plotted against their captors and escaped. You play an evil teddy, an evil teddy looking for revenge. Now you're out, the government are after you and so is Dr. Keeton, who has unleashed a band of twisted Hunter Bears to track you down and skin you. Or at least try. Character creation feels very much like the process you go through to create a personal bear like you do at those Teddy bear factories. 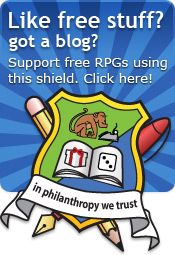 Bears are exceptionally individual and the GM is encouraged to award extra dice for particularly inventive creation. You first pick your form, which is the shape of your soft toy (plushie). Any shape is ok: lions, mice, ponies, cute garbage compacting robots and so on. Next you pick your fur colour (pink is recommended). Next you pick your tool, which is a item that help you perform your favourite action. If you're a throat-slashing sort of bear, you might find a bowie knife to be a good tool. Your Sucker is a thing you're a sucker for and will be the thing you're most interested in getting hold of. Peeve is the thing you irrationally hate. You get 10 dice to distribution between three Stats: Body, Mind and Soul. You also get a signature move, which is a combat move that is particular to you (gouging eyes etc). This is all woven onto a delightful and novel character sheet. The system is a dice pool: for any given action, you roll a number of D6 and any value of 4,5,6 is a success. To do difficult tasks, you have to get a certain number of successes. Opposed rolls goes to the person with the largest number of successes. The number of dice you get is determined by the most appropriate Stat and Trait. You get extra dice for equipment or if a player is particularly inventive. Failing at tasks can mean that you lose a dice from your stats. When your Body stat is at zero dice, you will need another bear to sew you back together. When Mind goes to 0, your bear goes mad, becoming an NPC. Whn Soul reaches 0, the evil that inhabits the bear returns to the spirit world. The Gamesmaster section is well formed, including information on tone, rule hints and adventure ideas. There are two example bear creations too, which highlight some of the more esoteric parts of character generation. The bestiary includes the Police and Federal Agents. The example throughout are appropriate and written in the same style as the setting, so they add cleverly to the tone without detracting from the ruling they are demonstrating. Clever. 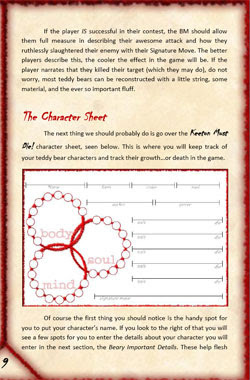 The equipment list is imaginative and provides an evil seed for those getting to grips with the idea of an evil teddy being fun to play. Can you imagine a Teddy Bear with Flame Thrower of Viking Death Axe? I can and it scares me. The setting is well organised and is littered with witty puns such as 'Beary Important Information'. Matt (also known as snickle on forums) blogged about how he went about it and makes for a good read. Dyson Logos has also created a character for it, offering his thoughts on the game too. Before I enter my familiar critique section, I would like to explain my "24 Hour Proviso". The 24 Hour Proviso is that I fully appreciate that the game was written in 24 hours and that it is a remarkable work. Only so much is possible in 24 hours, so my usual moan will assume that it's not a 24 hour game - for the purpose of a moan. The core explanation of the dice mechanic assumes the reader knows what a dice pool mechanic is and so is sketchy that you roll a bunch of dice. The Bear Creation introduction should tightly match the actual creation steps - even number them if need be. Some of the graphics are a little rough. Either do the images professionally or make them look like a child has made them, crayons and all. Finally, at 16 pages, the game feels a little short. I would prefer to see an example adventure and some more on the sample adventures. It's remarkable that while stationed in Iraq, Matt managed to churn out sixteen pages of fabric and stuffing based nightmare in 24 hours. For our competition, it ticks all the boxes and is attractive to boot. I doubt you would be able to string out Keeton Must Die to a four year campaign but if you're looking for a game to blow off steam, Keeton Must Die is for you. Well done, Matt, praise is rightly deserved.